"Eadie, John W. (Airdrie). - 'The Lame Souter.' 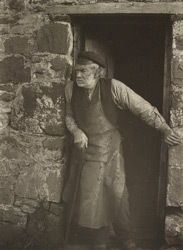 This photograph is reproduced as the frontispiece for the month, and is a most lifelike portrait of an old Highlander. Our reproduction is equal to, if not better than, the competitor's own print, which was taken with a R. R. lens, working at f/32, and an exposure, of an ordinary plate, on July 29th, 1890, 11.30 a.m., of 3 secs. The first prize, silver medal with ribbon and clasp, has been awarded to Mr. Eadie."